Using existing works as a starting point to create new ones is hardly new. The new work created could be great works in their own right, or they could be mediocre, or they could be poor. It doesn’t matter, as the original works, which are themselves often re-workings of then existing materials, are hardly likely to be replaced. So when Random House announced recently that they will be commissioning various writers to produce retellings, reworkings, updatings, cover versions (they seemingly couldn’t make up their mind which term to use) of every play in the Shakespeare canon, I couldn’t really see much to get too excited about. Whether this project can create anything even remotely of the stature of Verdi’s Otello or Kurasawa’s Ran remains to be seen, but let’s not pre-judge: even if it doesn’t climb to such heights, there may well be a few worthwhile books coming out of all this. As long, that is, as the writers take Shakespeare’s plays as starting points to express their own artistic vision, and not merely try to dress it up a bit to make it “relevant”. Sadly, though, I fear this is precisely the course this project will take. Random House’s press release speaks of bringing Shakespeare “alive for a contemporary readership”. Oh dear. That doesn’t bode well at all, does it? The implication that Shakespeare is dead to the “contemporary readership” doesn’t, I’m afraid, bespeak either much confidence in or much respect for this seemingly monolithic “contemporary readership”. All the usual noises are being made, including the obligatory kicking for that mythical creature the “Shakespeare Purist” (“The Shakespeare purists miss the point about…”) No doubt that “contemporary readership” that needs Shakespeare brought “alive” won’t be missing this point at all – whatever this point is, I forget. Ha! Stick that in your pipe, Mr Shakespeare Purist! We’ll just have to wait and see what the outcome is. Either way, there’ll be no harm done. You come home to find your 17-year-old daughter engrossed in a book. Which would delight you more – if it were Twilight or Middlemarch? The answer, for me at any rate, is unequivocally Middlemarch. This is not to say that I would object to our daughter reading Twilight novels: indeed, she read a couple of them a few years ago, with not the slightest hint of an objection on my part. However, I must admit that if she were still reading and enjoying these execrably written books at the age of seventeen, then I, as someone who values literature, would feel a bit regretful, to say the least, that her literary taste had not developed to any degree of sophistication. But if, on the other hand, I found her reading Middlemarch – especially if she were reading not because she had to, but because she wanted to – I’d be delighted, partly because a book such as Middlemarch is likely to prove enriching to her life, and also because embarking on such a book would indicate that she is prepared and unafraid to stretch herself. I do not intend to go into the details of Gove’s education policy here, except perhaps to say that, in the current system here in the UK, brighter children are often not, I think, stretched as they should be, and that more rigorous teaching of certain subjects, and to a greater depth, is indeed warranted; but that, on the other hand, it is dismaying that the very real advances that have been made over the years in the teaching of less bright children, or of children who may well be bright but who are struggling for any of a variety of reasons, or of children with various learning difficulties, and who, back in my day, would simply have been labelled “stupid” and ignored, are now in danger of being reversed. Much of the kicking that Gove’s proposed policies have been getting is, indeed, richly deserved – but not, perhaps, all. But let us not go into all that here. The point that I started off intending to make in this post, but from which I keep digressing, is that when I do a search on the words “Gove”, “Twilight” and “Middlemarch”, I find that Gove’s unexceptional (as it seems to me) opening gambit regarding Middlemarch and Twilight is also getting a kicking, mainly on the grounds that we cannot expect our seventeen year-old darlings to read something as challenging as Middlemarch; and, further, what’s wrong with Twilight anyway? It is strange that it is Middlemarch, of all novels, that now seems widely regarded as “worthy but dull”. I have argued in the past that we must allow for art not to be entertaining, but Middlemarch, for all its undoubted artistry, strikes me also as an immensely enjoyable novel. And yet, Mr Frank Danes, Head of English at King’s Ely Senior, a fee-paying independent school, wrote to the Times newspaper recently to say that if he were to teach Middlemarch to his 17-year-old pupils, then they, even though selected and hence, one may imagine, of an ability and intelligence above the average, would be “bored and mystified”. He adds, though, that he would be happy to teach them Twilight, although what there is in the Twilight books that merits teaching he does not specify. (I am sorry I cannot provide a link to this letter, as The Times website is beyond a paywall, but anyone who has access to back issues will find this letter in the edition of 14th May 2013.) Is Gove really so far off the mark, I wonder, when he speaks of lowered expectations in our schools? And recently, English professor and blogger Rohan Maitzen, concerned on reading somewhere on the net that Middlemarch is certain to kill off any book group, felt compelled to set up an online guide to the novel – Middlemarch for Book Clubs. The guide is excellent, and makes me want to re-read the novel, but the comment that led to the creation of this guide is, nonetheless, depressing. I tweeted her to say that any book club killed off by Middlemarch possibly deserves to die anyway, and she responded: “I guess I’m just too much of an optimist (or an advocate) to accept that! Else I wouldn’t be a teacher, I guess…” Indeed. I raise all this merely to record my delight when I found last night that our daughter, coincidentally of the same age as the hypothetical child in Gove’s example, has just started reading Middlemarch; and that she has started doing so off her own bat. I asked her if she was finding it difficult: she told me that yes, she was having to concentrate, but no, it was by no means prohibitively difficult. When I told her – and indeed, showed her examples from around the net – that various people seem to think Middlemarch to be too difficult for mere seventeen year-olds, she seemed quite offended by the suggestion. When I asked her if she still fancied reading Twilight books, she rolled her eyes and gave me the kind of hard stare that teenage daughters often give their parents. I ventured no further. No matter how slow the underlying tempo, a structured narrative requires a movement towards a particular end. But the problem is that our lives aren’t structured in this manner. The shapes our lives take are determined by all sorts of arbitrary events, unfortunate accidents, random surprises – none of which are foreshadowed, or held together by cunningly devised symbols and leitmotifs. Life, essentially, is drift. And yet if fiction attempts to depict life in such a manner, all we are likely to end up with an unseemly, unstructured mess. There is little point in protesting that this is precisely what our lives are: the mysterious rules that govern life are very different from the almost equally mysterious rules that govern art. So this naturally creates a problem when an author attempts to depict life as, essentially, drift. It is a problem that is addressed with superb skill in the novel Tithidore by Buddhadeva Bose. Published in 1949, it is a renowned novel in the Bengali-speaking world, though sadly virtually unknown in the West. This fine translation by Arunava Sinha deserves to make many friends outside the Bengali-speaking world, but unfortunately, it is neither publicised nor distributed outside India, and it comes without any sort of notes or glossary that, one might have thought, would have been indispensable to non-Indian readers. Given my own background I had little difficulty in following it, but anyone unfamiliar with the very elaborate system of address within an extended Bengali family, for instance, is bound to be somewhat flummoxed by the various Chhordis and Jamaibabus and Chhotomashis that pepper the text. Most confusing of all is Mama, which in Bengali refers to the mother’s brother, but means something quite different in Western languages. Given the effort that has gone into this fine translation, the publishers (Penguin India) could surely have provided a glossary to clarify these matters. A few notes may also have been added on the various customs and traditions prevalent in this particular society. Once again, I had no problem following these, but only when I see them laid out in a novel does it strike me how very odd, and, frequently, downright bizarre so many of them are. Most of these customs and traditions, I imagine, readers could pick up for themselves from the context, but this is not always the case. For instance, there is one point where Saswati has to force herself to mention her husband Harit by name, and most Western readers would interpret this, I imagine, as an indication of how hateful her husband is to her. However, within Bengali culture, it has traditionally been taboo to refer to anyone older than oneself by name (hence the very elaborate system of address within a family); and, given that the wife is almost invariably younger (sometimes very much younger) than the husband, this taboo has been particularly strong within marriage. However, in this instance, Harit, who regards himself as progressive, has obviously insisted that his wife refer to him by name, and his wife, who has had a traditional upbringing, finds this difficult. I really cannot see how a Western reader can be expected to understand something like this without notes. A list of character names may also have been provided, especially given that the five sisters at the centre of this novel – Shweta, Mahashweta, Saraswati, Saswati and Swati – have such similar names. I do hope that Penguin India will see to these matters in future reprints, as the novel is clearly a work of considerable stature, the translation excellent, and the whole package deserving a wider readership. However, as things currently stand, if you live outside India, you will be very unlikely to find it in the bookshops (although a Google search will indicate the various mail order outlets from which it may be purchased). Of course, there are many difficulties in translating from Bengali. The first involves the title itself, Tithidore. Tithi, as I understand it, refers to phases of the moon – e.g. purnima-tithi refers to the full moon – so the whole thing refers to cycles of time. And dore is a string that is used to bind. So Tithidore means … well, figure it out for yourself! It is impossible to translate, or even to paraphrase, and When the Time is Right is certainly a better English title than any I could come up with. The novel is a family saga, starting – calculating back from the ending – in the 1910s or so, and ending with the marriage of the principal character Swati – the youngest of the five sisters – in the early 1940s, with the talk amongst the wedding guests often touching on the possibility of the advancing Japanese armies bombing Calcutta. The politics of this turbulent era is a constant presence in the background, but it is never allowed to intrude into the foreground: this is not a political novel, but a domestic one: the war and the Independence movement make but a background rumble. The focus falls firmly on the family – initially on Rajen-babu and his wife Sisirkana, their five daughters and their son Bijon; and, as the novel progresses, increasingly on the expanding consciousness of the youngest daughter Swati. The characters are all vividly depicted: indeed, it is the characters rather than the plot developments that hold our attention. The few elements of plot that emerge promising to lead to momentous events in the future don’t really, when it comes to it, lead to anything much: the son, Bijon, not the sharpest tool in the box, and resentful of his family that had never really loved him, becomes involved in what appears to be shady business. It probably is shady, but the dramatic developments we may have expected from this don’t develop: there is no disastrous failure, no criminal prosecution, no disgrace. Bijon’s business associate, the unrefined Majumdar, pays court to Swati, but this leads neither to scenes of an unhappy marriage, nor to dramatic scenes of confrontation and anger when he is refused. Saswati, the fourth of the five daughters, is married to the unpleasant Harit, a communist and idolator of Stalin: he imagines himself an intellectual, is uninterested in his wife, or, indeed, in anyone else around him, and looks down on everyone with barely disguised contempt and disdain. A marriage such as this would most likely have led to divorce in a society in which divorce is socially acceptable. But here, although their union is depicted as strained, there is no such dramatic development: no divorce – not even a dramatic confrontation. Life, as ever, seems to drift on in its seemingly aimless manner. This is, in many ways, quite the most non-dramatic novel I think I have come across: all drama – indeed, all possibility of drama – is eschewed. At the centre of this novel is the growing consciousness of Swati, and her awareness of her love for Satyen, a teacher of literature. It is easy for the modern reader, especially perhaps the Western reader, to wonder why it takes these two so long to realise their love for each other, but in a society in which all marriages are arranged by parents, expectations are different. However, we do not find it difficult following the course of their thoughts, or the development of their perceptions: what is extraordinary is not that human beings are all the same – they clearly aren’t – but how at home we can feel in the minds even of those very different from ourselves. 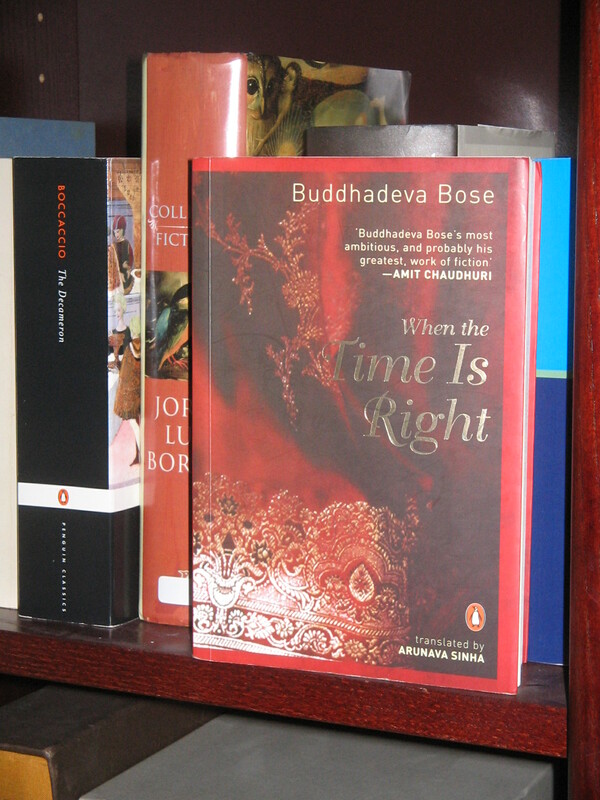 Buddhadeva Bose takes his time. When characters meet, what they say to each other is given in full, and almost always in direct speech: there is no sense of compressing, or directing the reader’s attention to what is important, because here, everything is important. Neither is there any sense of urgency in moving the story along, because there is no specific end to move it towards. All this could have backfired disastrously were we not held so firmly by the characters, and by the intricate nature of the relationships between them. At each stage, it is the moment that is important, rather than what the moment might lead to. And these moments are all so vividly painted, so we don’t care whether or not they lead to anything. Bose loves the big set-pieces – the big family reunion for the Durga-puja holidays; the visit to the cinema; the national mourning at the news of Rabindranath Tagore’s passing, and his funeral (“The Rabindranaths of this world don’t die,” Swati reflects, “they go away from time to beyond time, out of their bodies into people’s minds…”); and so on. After the scenes of Rabindranath’s funeral, comes a death closer to home: the husband of the eldest daughter, the good-natured Pramathesh, has a stroke and dies shortly afterwards. There has been no novelistic foreshadowing of this: it just happens, as these things do in life. Arbitrary, random. … Shweta looked up at the sky, stars, silent; Swati didn’t stir, Satyen didn’t stir, both silent; the shadowy light of the lamp on the tray; hidden, shy, words that couldn’t be said, unforgettable; the door opened, dark; neither of them spoke, neither of them forgot; two of them in the dark room, two of them in the dark, side by side; shrunk, taut; didn’t speak, didn’t forget; Shweta stopped; Rajen-babu, with his hand on the wall; taut; two lives, creatures, throbbing hearts, throbbing bodies; no eyes, eyes, open windows, black; black outside; stars in the black sky; distant, other side, other world; all that had happened, not happened, would keep happening, eternal; a sky of stilled stars looked on. Buddhadeva Bose was a distinguished poet as well as novelist, and even when writing prose, he is not afraid to play with language as he would in a poem. It must be a nightmare to translate, but the effect is as affecting as it is startling. For me, it was a curious experience reading this novel: the society depicted seemed at the same time very close and yet very distant. But when Buddhadeva Bose takes us into the minds of the various characters, I don’t think I had any difficulty understanding them. It is hard to understand why, given there exists a wide readership in the West that is genuinely interested in encountering other cultures through literature, this novel has not been more widely distributed and publicised: it certainly deserves to be. And it is very much to be hoped that if it is distributed more widely, Penguin India will provide some notes and glossaries for future editions. In any traversal of the Shakespeare canon, King Lear is a biggie. In terms of sheer titanic power – or, indeed, in terms of anything else one can think of – it is both unsurpassed and unsurpassable. So when it appeared in the much maligned (and, in my view, unfairly maligned) BBC Shakespeare series in early 80s, expectations, even for a series that had not till then been particularly well received, were high. In the end, the consensus of opinion was that it was yet another disappointment. I certainly thought so at the time. In particular, I wondered why Michael Hordern, better known as a comic actor, was cast in what many would consider the most powerful of all tragic roles: it seemed perverse given that thespian heavyweights such as Gielgud, Olivier, and Scofield were still around. Hordern seemed to me far too lightweight, and the whole thing an opportunity missed. But having watched the production again recently, I find myself revising my opinion quite radically. It is by no means a perfect production: like so many others in the series, it seems under-rehearsed, with that otherwise fine cast not always knowing quite what is expected of them while they are in shot but not speaking. However, to my surprise, for all its shortcomings, this production does seem to me to get to the dark and despairing heart of this extraordinary drama which, even after almost a lifetime’s acquaintance, retains the power to shake us to the very core. Possibly the first thing to say is that whatever the shortcomings of this production, the casting of Michael Hordern is not amongst them. It was clearly not the case that he had been cast because the likes of Gielgud or Olivier or Scofield weren’t available: this was the second time director Jonathan Miller had directed King Lear for the BBC, and he had cast Hordern in the earlier production also. 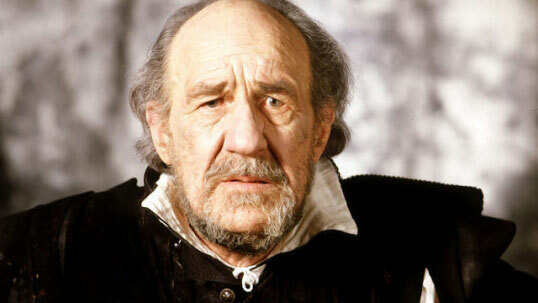 He had also directed Michael Hordern as Lear on stage. Putting aside my own preconceptions regarding Lear, this is how Miller sees the character – not larger than life at all, not possessed of any grandeur or magnificence, but one who, once the robes and furred gowns no longer hide all, is revealed to be merely frail and human and smelling of mortality. The events that overtake him are apocalyptic, but it is in the inadequacy of frail humanity in the face of such apocalyptic events that the tragedy lies. Given this conception, Michael Hordern turns in what strikes me now as a superb performance. From his childish but nonetheless potent tantrums when he banishes Kent and Cordelia to the greater but utterly impotent rage in the superbly staged storm scenes (filmed in the studio, and all the better for it); from his growing awareness of how little his mortality signifies to his glimpses of that which may possibly transcend it; it is, once I had accustomed myself to a reading smaller in scale than I had been used to, utterly convincing at each step. Particularly good is the meeting with the blind Gloucester (the excellent Norman Rodway) on the heath – a scene which, like that of Cassandra before the House of Atreus in Aeschylus’ Agamemnon, may be considered to be representative of the highest peak of the tragic imagination: this scene is played with a disconcerting directness, and utterly without sentimentality. No appeal to tears here, no attempt to evoke pathos: the drama is beyond tears by this stage. Another of Miller’s ideas is to present a Fool who is as old as Lear himself. And, as in his previous BBC production, he chose Frank Middlemass for the role. It works superbly well: here is a Fool who can address Lear with ease and familiarity not merely because he is “all-licensed”, but because he and Lear, though respectively servant and master, have spent their entire lives together. The Fool’s barbs come from a lifetime of understanding, and, out in the storm together, he, old and unaccommodated, is as frail and as tragic a figure as his master is. The supporting cast is equally impressive. Penelope Wilton’s Regan, for instance: Regan of course is a very disturbing character (“Then let them anatomize Regan; see what breeds about her heart. Is there any cause in nature that makes these hard hearts?”), but I found something quite uniquely unnerving about the girlish smile with which she views even something so unthinkably horrific as an old man having his eyes plucked out. And Anton Lesser made far more of Edgar that I would have thought possible. I could have done without the heavy-handed Christ imagery that Jonathan Miller lumbers him with, but there are certain scenes here – most notably the one where Edgar, initially in a self-pitying mood, sees his father eyeless – where one is tempted to think that it is he who is at the play’s tragic heart. Edgar is, it must be conceded, an under-written character, whose motivations are frequently vague, and whom it is almost impossible to bring to life; but rarely have I seen an actor make so much out of such little material. The only slight disappointment amongst the supporting cast was Michael Kitchen’s Edmund – disappointment because, given what a fine actor we all know he is, more might have been expected: Edmund is surely amongst the most unmitigated evil characters in literature, but we get little here beyond merely a likable rogue. More, I can’t help feeling, may have been attempted. The entire thing is shot in the studio, employing minimum sets, and with much use made of close-ups. This seems to me an ideal way to put King Lear on screen. Those wanting a more heavyweight assumption of the role of Lear is best directed, I think, to this extraordinary audio recording from the 60s featuring Paul Scofield, but, if one can accustom oneself to a very different though equally valid conception of the role, this version, though not perfect, is, to my mind, the best of all currently available DVD versions that I have seen. As any good production of this play should, it overwhelms. David Balfour, a well-educated young man living in 18th century Scottish Lowlands, and with connections to landowning gentry, finds himself, after a series of unexpected adventures, in the Highlands. He finds himself in the company of fellow countrymen who are somehow not his fellow countrymen, so alien are they to his own cultural values. And he finds himself a bosom friend of a man whom, in the normal course of events, he would have regarded as a traitor. And with this unlikely friend, he tries to evade the soldiers of the British Army, the redcoats, whom, again in the normal course of events, he would have regarded as being on his side. In the face of all this, the very idea of taking sides, of choosing one’s side on the basis of one’s cultural background, seems to dissolve. To compound this cultural confusion, in the latter half of the twentieth century, a young lad of Indian background, living in the Scottish Lowlands, nine years of age, and whose awareness of the English language did not extend beyond half these nine years, was thrilling to this tale. Indeed, this Indian lad was David Balfour. His imagination excited, he scoured the local children’s library for books about the Jacobite Rebellion, about the Highland clans, and greedily absorbed what he could. And his primary school teacher, on observing his interest, tried to encourage it, and, indeed, to tell the rest of the class – indigenous Scottish children all – something of what many would term their history. In his mind’s eye, this Indian lad saw himself hiding from the redcoats in the heather with Alan Breck Stewart; he found himself witnessing the assassination of Red Fox, and coming under suspicion as an accessory; he re-lived in his mind meeting with James of the Glens, and felt something of his terror. He was so thoroughly immersed in it all, that the curtain separating reality and fiction seemed unimportant – as unimportant as it can only be in the mind of a child whose imagination has been stirred into action. The fiction seemed more real than reality itself, and, as with David Balfour, cultural affiliations based on the mere accident of birth seemed to dissolve. I wonder how this child would have felt had he been told that none of this was actually “relevant” to his own life – that he wasn’t a Scottish Lowlander with connections to the gentry, and that he couldn’t really be David Balfour, as David had a white face and he had a brown. That the Highland clans and the Jacobite rebellion should mean little to him as these weren’t part of his history, and that, indeed, for that very reason, these topics should put him off history altogether. That the books that he should relate to most strongly were dreary books about race which would tell him what the various taunts and abuse he and his family experienced regularly had already told him – that racism exists, and is a Bad Thing. Sadly, this appears to be what new newly crowned Children’s Laureate does appear to be saying, to much approbation, it appears, from newspapers from across the political spectrum. Kidnapped by Robert Louis Stevenson? “I can’t be doing with this stuffiness about only reading classics,” she says. What a shame. I suppose there is no point feeling angry about any of this. One can’t hold back the tide, after all. But perhaps I am entitled to be just a bit sad, as I immerse myself again into Kidnapped, and once again flee the redcoats in the company of Highlander Alan Breck Stewart. I am not really much of a genre reader. By which I mean that while I do enjoy a good thriller when I come across one, I don’t go out of my way specifically to hunt them out. Perhaps the only genre where I do make something of an effort in this respect is the genre of ghost stories – which I find ideal for bedtime reading when the mind is tired and can’t concentrate on anything too demanding – but even here, the range of my reading is nowhere as extensive as that of true devotees. Perhaps this general indifference to genres, even of genres I quite enjoy, explains why it has taken me so long to get round to Patricia Highsmith. I have long read and admired classic American noir writers such as Dashiel Hammett, Raymond Chandler and James M Cain, and have also enjoyed what I have read of contemporary writer James Ellroy, and, had I been less haphazard in planning my reading, I am sure I would have encountered the highly regarded Patricia Highsmith earlier. But in any case, it was worth the wait. Graham Greene once referred to Patricia Highsmith once as.a “poet of apprehension” rather than of “fear”. It’s an interesting distinction. Much of the tension of The Talented Mr Ripley comes not from what actually happens – although that is horrific enough – but from what Ripley, the utterly amoral and possibly schizophrenic title character, is afraid might happen. And we are invited to share his apprehensions. This in itself makes for a curious reading experience. For why should we be apprehensive on behalf of a man who is, from any reasonable viewpoint, despicable? Why should we worry that a man might be caught when, away from the spell of the book, we’re in no doubt that behind bars is precisely where he belongs? Yet so skilful is Highsmith in enlisting sympathy for that which should really be outside its bounds, that any moral compass we started with soon becomes well and truly deranged. The plotting is tight. It starts with the wealthy Greenleafs, under the mistaken impression that Tom Ripley knows well their son Richard, hiring him to go to Italy to persuade him to come home. The set-up is clearly that of Henry James’ late masterpiece The Ambassadors: that novel is even mentioned here by name. And while Tom Ripley is clearly no Lambert Strether, he, like Strether, falls in love with the lifestyle from which he has been commissioned to extricate his friend. But while Strether ponders in characteristically labyrinthine Jamesian prose on the ethics of what he newly perceives, Ripley, described in a prose style somewhat more forthright, appears to have no conception whatever of morality. It is not giving too much away to reveal that, after a while, he murders the man he has been sent after, and then assumes the dead man’s identity. It is not giving too much away because up to the point of the murder, what we had been reading was an intriguing study of character; it is only after this murder that it becomes apparent that this novel is indeed, a thriller. Ripley’s motives are complex. Money is certainly one of the driving forces; but there is also the excitement of danger. For all his talents, Ripley is no strategist: he can improvise brilliantly, but seems incapable of making long-term plans, and, as a consequence, all too easily and all too frequently finds himself on the verge of being discovered. But he enjoys the danger: it seems almost to give his life a purpose that it had formerly lacked. At one point he reflects that even if he is caught, it would all have been worth it. But chief among his motives is, perhaps most intriguingly, a certain self-hatred, and a concomitant desire to become another person – actually to become someone whom he seems rather to like, and whom, possibly, he finds desirable. He is never quite so divorced from reality as to completely imagine himself as other than Tom Ripley, but even the extent to which he feels the responsibility for his crime depends on which identity he happens to be assuming at the time. But whatever responsibility he assumes, he never feels the slightest twinge of guilt. Even when meeting the woman who had clearly been in love with his victim, or when meeting the victim’s heartbroken father, the consequence of his crime, the emptiness it has left behind in the lives of others, do not even occur to him. These are indeed things that the readers have to infer for themselves, as Highsmith does not allow us to enter any mind other than Tom’s. And being constantly in the mind of such a person is disorientating, and, frankly, somewhat unnerving. As we worry about the fate of this deeply disturbed and dangerous individual, we cannot help but worry for our own sanity. The pacing is masterly, as I think it has to be in any good thriller. The opening section, leading up to the murder, is deliberately paced, as it had to be to establish character and situation in sufficient detail. But thereafter, Highsmith knows perfectly when and to what extent to tighten and loosen the tension. The prose tends generally not to draw attention to itself, but in key passages it can become quite explosive. It would be unfair to reveal any more of the plot than I already have. While it may be argued that the plot is not of central interest – it very rarely is in any fiction of quality, even thrillers – it is not, obviously, unimportant, and the twists and turns it takes stretch Ripley’s apprehensions, and ours, to the very limit. A “poet of apprehension”, as Graham Greene said. The result is a compelling read, but somewhat too disturbing for comfort. I’ll certainly read more by Patricia Highsmith, but perhaps not just yet.